Appearance: Since she is mostly Old English Sheepdog, Lucille is white and grey with long, fluffy fur. She often has to cut mats out of her fur, so it tends to be a bit choppy. It hangs in her face in all forms to the point where it looks like she may not be able to see very well. Her left ear and the left side of her face are grey while the right side is white. The grey follows over her shoulders, all the way down her back, and her back legs. Her left front leg is also all grey except for her paw while her left front leg is white starting about halfway down. As is fairly common with Old English Sheepdogs, Lucille has heterochromia. Her right eye is light blue while her left is brown. The line of sheepdogs Lucille comes from does not have a natural bobtail, and so she has a grey feathered tail which turns white about two thirds of the way down. 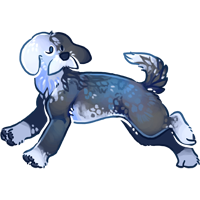 Lucille's body is quite round, like that of a normal Old English Sheepdog and she walks with a rolling gait in Lupus, where she is 23 inches (58 cm) tall, and weighs about 70lbs (32kg). Seuci is not a form Lucille finds herself in often, although she gains height and bulk, standing at 36 inches (91 cm) and weighing 130lbs (59kg). Most often, Lucille can be found in her Optime form. Her fur is still shaggy, and her mane grows longer. She keeps the fur parted on the side, flipping some white over onto the grey. Her figure is pear shaped: broad hips and a smaller bust. She is 5 feet, 5 inches (165 cm) tall and weighs 150lbs (68kg). Personality: Outwardly, Lucille is a loyal, headstrong, independent, driven canine. She is family-oriented, and thoroughly enjoys large gatherings. She also likes to be organized and have everything in its place. Lucille tries not to care about what people say or think of her, and lets most insults simply roll off her shoulders, but once she gets angry, she doesn't always know when to back down from a fight or argument. Biography: Lucille was the only surviving puppy of a litter born to a very young first time mom. Their family was close anyway, and she was raised amongst some cousins as well. When she and her cousin were almost a year old, they decided it was time to head out and travel. They managed to get work on a ship, Lucille as the cook and her cousin as a sailor. Gus and Lucille continued traveling and during one of their trips home, the rivers flooded, forcing the little group to move. Lucille suggested a new place to settle, one they had passed during their travels, and so the group agreed on it and started the move. They eventually settled on new lands in 'Souls to form the pack, Krokar.